I absolutely recommend you visit the Atlas Mountain and the Berbers when in Morocco. You will never know true Morocco until you have visited the Berbers! The visit to the Berbers of Morocco, reminded me of the importance of simplicity in our lives. Watching these amazing people, and the very simple life they have, where happiness is definitely not reliant on acquisitions or any belongings but rather on the human connection, the extended family the communal support… and seeing their faces that shine with honest smiles, warm and welcoming, offering you all that they have because that is what we (humans) do; connect, share and converse. The connection, understanding and experience with these beautiful people was beyond expression; one of those things that get lost in the description. At some point during the day, I found myself standing by one of the walls, at the side, in that Berber family’s home and saying: “There are no words to express what is taking place here today.” I really felt a deep appreciation in my soul to this encounter. I felt so connected to a place within myself that is not easily reachable, and hence the words. That is really how I felt and continue to feel every time I look at these photos. Perhaps something in me, wishes to have that kind of life, or that kind of simplicity. Believe me, I am yet to meet any other people that are this happy. What struck me the most that day, was the insignificance of language! We do understand one another on a deeper level. If we were to mute everything and take in the experience. Between the colloquial Berber language, French, Moroccan Arabic and mainstream Arabic, we managed to converse. 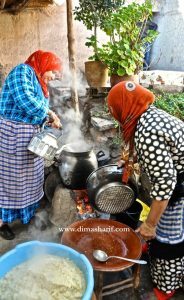 However, the most connection happened when those women (both at the berber family home and at the Argan Cooperative) started singing – in a very high pitched voice that perhaps was not a records winning quality – there was a silence! by everyone, in respect to the human voice that is demanding our attention. A voice, which to me spoke a language I did not understand, was crisp and full of emotions that somehow I understood everything! I understood that woman, her motherhood, her role, her belonging to a greater family, her love to her people, place and life, most importantly her and my presence at that very same place, at that moment, sharing the most amazing Berber Tagine and looking at the same scenery, smelling the same air and belonging to the same earth. Despite how similar or different we could have been, at that point we were one, and she sang and I listened. We connected. Similarly at the women’s cooperative, I was stunned by these women’s lives. a virtue that I sometimes completely lack, kept creeping into my soul and demanding me to explain to myself what was it that I am in such a hurry for?! Always, rushing and running and always “can’t wait”! These women, day in, day out, from morning to evening do the exact same thing, in the same place, with the same people! Seated in a dark room, that if it was not for the few narrow windows scattered around, breaking in some light, it would have been pitch dark. With the small rays of light these women shine, very colourful and utterly beautiful. 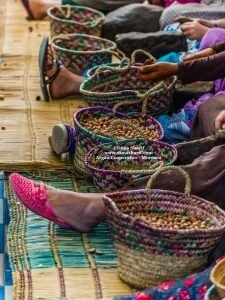 They sat, on very uncomfortable seats, all day in the perfect assembly line, breaking the skin of the argan seed with a stone, peeling that skin, then breaking the shell to extract the small argan almond, which is then ground to extract its beautiful oil. No entertainment, barely any light, they sang, solo at times, in a group at other times, and always repeating after one another… in that dark room, these women had one voice, their own voice inseparable from one another. 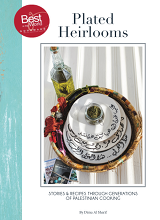 Together they unshelled and removed the layers, starting with the hard cover, then the inner skin to reveal the beautiful and pure argan almond. They talked, advised and helped one another and they tirelessly repeated the process every single day! In the presence of such serenity and such acceptance, I cannot help but wonder, what it is exactly that we keep complaining about? Or better yet, what is it exactly that is wrong with our lives that we are so restless! Some experiences are life changing! Yes, sounds like a cliche but never when you encounter one, and that day was such to me. In the absence of language, light and all things familiar, I learnt a huge deal about the essence of who we are. Perhaps even about love! In that set up I found the kind of experiences I am always in search of. Perhaps things do not have to be explained, and perhaps in the most un-understanding we do just that : understand. Perhaps making sense of everything is the reason why nothing makes sense. Sometimes all we need to do is just let things be the way they are and leave it at that without our interference – maybe then we come face to face with and actually meet pure happiness!